Bridges, Young, Matthews & Drake PLC, commonly referred to as the “Bridges Firm,” dates back to 1888, when Frank G. Bridges, Sr., began practicing law in Pine Bluff, Arkansas. Today, the firm’s clients include individuals and corporations engaged in a wide variety of businesses, including commercial, farming, industrial, banking, health care and insurance. 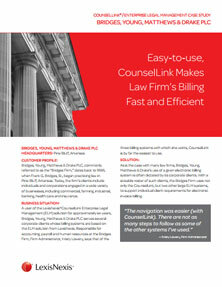 A user of the LexisNexis®CounselLink Enterprise Legal Management (ELM) solution for approximately six years, Bridges, Young, Matthews & Drake PLC serves several corporate clients whose billing systems are based on the ELM solution from LexisNexis. Responsible for accounting, payroll and human resources at the Bridges Firm, Firm Administrator, Kristy Lowery, says that of the three billing systems with which she works, CounselLink is by far the easiest to use. As is the case with many law firms, Bridges, Young, Matthews & Drake’s use of a given electronic billing system is often dictated by its corporate clients. With a sizeable roster of such clients, the Bridges Firm uses not only the CounselLink, but two other large ELM systems, to support individual client requirements for electronic invoice billing.